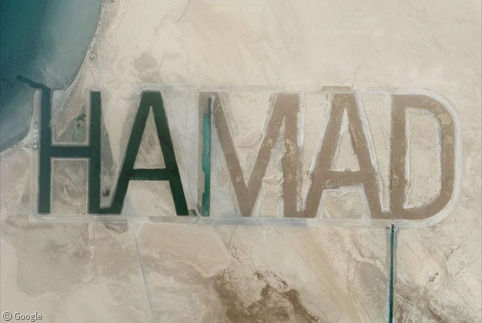 Doing the rounds on the mainstream sites this week has been the story of Abu Dhabi’s Sheikh Hamad bin Hamdan Al Nahyan, who has created a series of canals in the coastline of his own private island that spell out his name, “HAMAD”, in enormous water-filled letters. This single 5-letter word is over a mile long1 and some media outlets are claiming it’s the world’s largest graffiti. We first wrote about this brilliant bit of enormous typography all the way back in 2006, but at the time it was only partially completed, simply saying “HA”. 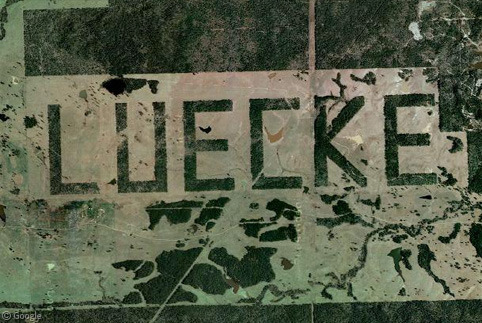 Our original post on Luecke has the full story in the comments thread, including an explanation from Mr. Luecke himself. This land is my land (yes, really). As my nephew Pete already pointed out, I did it for the hell of it. I was going to open a golf course, but decided not to. If you look in the “L”, you can see 4 holes of my private “course”, though I haven’t maintained it in a couple of years now (due to some surgerys preventing my game), so you might not be able to make it out. My son showed me on the Google Earth program, and you could indeed see the bunkers and barely make out the fairways. If Sheikh Hamad continues to write out the rest of his (somewhat wordy) official title, then he could potentially make one of the longest pieces of writing on the planet (longer even than the world’s longest poem), but he’d have to think a whole lot bigger if he were going to best the insane type-size of the 2,592,000 point Luecke sign! Although you can of course easely find it below the original post. Strange – that link works for us. However, I’ve quoted the original comment in the article for clarity – thanks. An hour ago (at another PC) the link worked for me as well. But I get the error as well now. Does anyone have the heart to tell him its upside down? What a douche, save some whales or kids, or something. What a waste.